It's 1850 and new rabbi Avram Belinski sets out from Philadelphia toward San Francisco. Cowpoke bandit Tom Lillard hasn't seen a rabbi before. But he knows when one needs a heap of help. And getting this tenderfoot to Frisco in one piece will cause a heap of trouble - with the law, Native Americans and a bunch of killers. 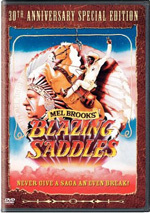 Gene Wilder and Harrison Ford are one feisty team as rabbi and rescuer in this rough-'n'-ready romp that rivals Wilder's earlier Blazing Saddles in Wild West hilarity. Director Robert Aldrich is a seasoned hand at blending roughhouse and laughter, as fans of his earlier The Dirty Dozen and The Longest Yard will attest. With a full posse of screen talents, The Frisco Kid rides tall in the comedy saddle. For a few lessons in advertising, we need look no further than the DVD release of 1979’s The Frisco Kid. Take a gander at that cover. With its giant head shot of Harrison Ford, poor Gene Wilder – the true star of the movie – gets relegated to a tiny inset picture. The message is clear: Ford’s mug moves DVDs, but Wilder’s doesn’t. As tactless as the cover may be, it doesn’t misadvertise too badly. After all, Ford does play a major role in the film. The flick’s trailer is a different matter as far as truth in advertising goes. Although fresh off the success of Star Wars, Ford barely appears in the trailer. Instead, it focuses on Wilder and heavily touts his appearances in hit films like Blazing Saddles, Silver Streak and Young Frankenstein. The message? Expect Frisco to offer another wild and wacky comedy with Wilder. However, the reality turned out to be rather different. Set in 1850, Frisco introduces us to Avram Belinski (Wilder), a recently ordained rabbi in Poland. Though not the sharpest blade – he placed 87th in his class of 88 – he gets an assignment to head to San Francisco and lead a temple there. Avram makes it to Philadelphia okay, but after he misses his boat to San Francisco, he gets robbed by some low-lifes who offer him a wagon ride out west. They leave him on the side of a road, but he gets some help from an Amish clan. They offer him enough money to take a train part of the way to San Francisco. That journey provides our first look at Tommy Lillard (Ford) when he robs the train. Avram misses that occurrence but soon bumps into Tommy. When Avram departs the train, he lacks many resources and meets Tommy when the latter helps him snare some fish. The two soon become an odd partnership as Tommy grudgingly helps Avram make it across country. Along the way, they go through many adventures and become pals. When Frisco hit the screens in 1979, I recall that I believed it was a new film from Mel Brooks. After all, Brooks worked with Wilder many times in the past, and a flick about a Jewish cowboy – as ads touted Frisco - sounded like something up Brooks’ alley. As it happens, Brooks had no involvement in Frisco whatsoever. Instead, Robert Aldrich directed the flick. My most recent experience with an Aldrich movie came when I watched the original version of The Longest Yard, an effort that I found to be confused and muddled. I guess that means I shouldn’t be surprised that I thought Frisco was confused and muddled as well. Much of the time Frisco feels like a much longer movie cut down to fit time limitations. At 119 minutes, Frisco already seems too long for this sort of film, but as was the case with Yard, the piece suffers from jerky editing. Many scenes end abruptly, and there’s exceedingly little narrative flow to matters. Our leads go from one spot to another without much to connect events, and the story fails to explore issues and characters well. These problems extend to the movie’s tone. As I mentioned, the trailer touts Frisco as a Mel Brooks style comedy, but that’s not remotely the case. Though it attempts laughs at times, it almost never achieves them, and the story seems inappropriate for that sort of tale. In truth, Frisco would work much better as an adventure drama. The story comes with many moments that depict how Avram’s faith helps him, and that attitude would fit better with a more serious movie. Instead, Frisco tries to have it both ways. It really does stick with a more serious tone much of the time, but then it’ll toss in a wacky bit here or there. Frank De Vol’s score also attempts to leaven things, but it sounds out of place. It’s like putting Carl Stalling music on top of Sophie’s Choice; the drama doesn’t match with the goofy music. No one seems to know what kind of movie they want to make. Much of the story focuses on the drama but the actors seem to think they need to play it for laughs. I like Wilder but he does a terrible job here. He simply bugs out his eyes and shouts most of his lines. Much of these odd readings make little sense. He turns Avram into a charmless, annoying character. In the end, the movie’s problems mainly reside with the director. He made The Frisco Kid a flick with no consistency or clarity. Is it a wacky comedy or a serious drama? No one seems to know, and the audience suffers through this poorly edited mishmash. 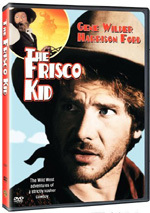 The Frisco Kid appears in an aspect ratio of approximately :1 on this single-sided, double-layered DVD; the image has been enhanced for 16X9 televisions. I didn’t expect much from this transfer, but it usually looked pretty good. Sharpness generally came across well. Occasionally I noticed some slightly soft elements, but those weren’t dominant. Instead, most of the shots seemed crisp and distinctive. No issues with jagged edges or shimmering occurred, and I saw no edge enhancement. Source flaws played an inconsistent role. Much of the movie looked surprisingly clean, as grain was the most common distraction. However, some scenes suffered from more intense defects such as specks, marks, blotches, streaks and lines. Again, these were the exception to the rule, but they created some concerns. Colors mainly looked quite nice. The palette tended toward a slightly pale side of naturalism, and it could seem a bit too subdued at times. Nonetheless, the tones usually were reasonably lively and full. Blacks seemed deep and dark, while shadows were appropriately concise and visible. The source flaws almost knocked down my grade to a “B-“, but the movie usually looked so good that I thought it earned a “B”. I found the monaural soundtrack of The Frisco Kid to be satisfying. The mix has held up fairly well over the last 27 years. Speech came across as warm and natural, with only a few issues related to edginess. Effects appeared fairly full and dynamic, and they didn’t suffer from any distortion or other problems. Music also was bright and rich, with pretty nice range. During percussive scenes, the score offered very strong bass response. For an older monaural soundtrack, Frisco was more than adequate. Unfortunately, the supplements were less pleasing. All we get is the film’s theatrical trailer. When I reviewed Robert Aldrich’s The Longest Yard, I called it “a really muddled piece of work. It often jolted me with its awkward editing and nonexistent transitions. The film manifests occasional amusement but never congeals and becomes a coherent piece of work.” Similar – though perhaps less severe – thoughts greet Aldrich’s The Frisco Kid, a poorly assembled and never very entertaining movie. The DVD offers pretty solid picture and sound, but it lacks substantial extras. Somebody out there must like this erratic, jumbled flick, but I didn’t think much of it.